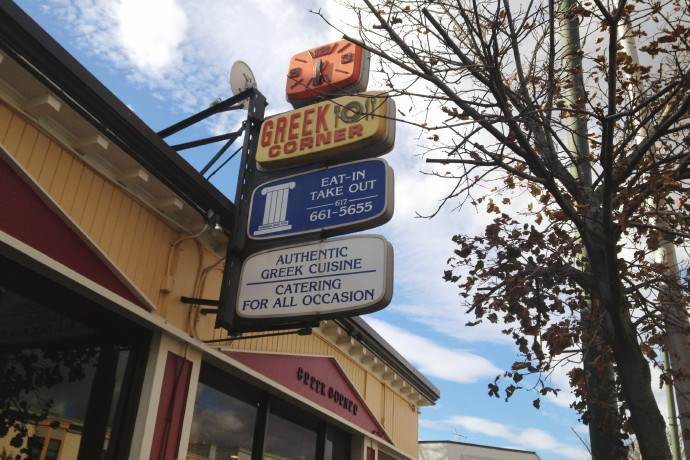 Like a number of restaurants in North Cambridge, Greek Corner tends to be one of those places that is easily overlooked, even to those who live in the immediate area. Driving by the restaurant, it's possible to not even know it is there, because it is located in an unassuming building in a relatively quiet section of North Cambridge and doesn't exactly have bold signage. The food, however, is anything but plain, and thus makes Greek Corner a true hidden gem of the Boston restaurant scene (though Guy Fieri of "Diners, Drive-Ins, and Dives" did put it on the map for at least a short time by featuring it on his show in 2010). Although it looks like one of many tiny shops and restaurants along this stretch of Mass. Ave. in North Cambridge, the low-key, family-owned Greek Corner is deceptively spacious; once inside, there are two rooms of tables, with the main dining room to the left having plenty of space for large and small groups alike. It is rarely crowded, though occasionally the place can get full, especially on weekends. Parking can be difficult (Cambridge can be a very tough city for parking), but you should be able to find something if you drive around the block a few times. Greek Corner features freshly-made food that, as is the case with many Greek restaurants in the Boston area, won't break the bank. Lovers of Greek food will probably want to start with the chicken, lemon, and egg soup (called "Avgolemono"), which is a must on a chilly day, or perhaps the feta and olives plate which comes with oregano and olive oil along with pita bread. Another excellent choice for a starter is is the saganaki, which consists of a buttery kaseri cheese that is doused in ouzo and lit on fire. Both the meat/seafood dishes and the vegetarian dishes are recommended (a vegetarian plate is available for those who wish to sample a bit of everything), with standouts being the flaky spinach pie, stuffed grape leaves (the grape leaves can also be ordered as a meal), tender and lightly-breaded calamari (as an appetizer or a calamari plate with a salad and rice), a meaty and rather large falafel, hearty pastitso (a kind of Greek baked ziti or lasagna), a slightly spicy moussaka, a rich and delicious lamb and beef gyro, an equally solid chicken gyro, and any of the kebabs. Sandwiches are very good, and some of them (such as the falafel wrap and the aforementioned gyro) are quite large and filling enough to warrant a doggie bag. Drinks include Mythos beers, and make sure to save room for dessert, as the baklava is excellent here. Greek Corner may be a bit out of the way, especially if you depend on the MBTA to get around, but it is well worth the effort, since there are few places in the Boston area with better Greek food. Plus, you can tell your friends that you found a great Greek restaurant that even many of the locals--myself included, until fairly recently--don't seem to know about. Copyright © 2004-2019, Boston's Hidden Restaurants (www.hiddenboston.com).